Keeping your reptile at the correct temperature is crucial to their well-being. 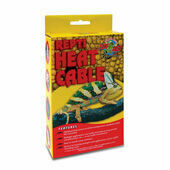 Our range of reptile heat cables can help to provide your pet with extra warmth in order to improve their blood circulation, immune system and metabolism. Our selection includes such brands as Zoo Med, which ensures a high level of knowledge and care has gone into each product, therefore offering the very best for your reptile.